Killer clowns in a blue van, shovel-wielding fox-masked vigilantes, and the last bus you’d ever want to ride… You must be in Sinkhill! 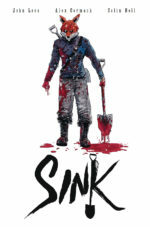 SINK Volume 1: Welcome to Glasgow collects the sold-out, smash hit first volume of the crime horror series Big Comic Page calls “brutal, shocking, and packed with a creeping sense of dread that will linger long after you’ve finished reading.” You’ll enter a forgotten East End district of a warped funhouse mirror vision of Glasgow, Scotland. Sinkhill is a hive of crooks, deviants and killers, and ordinary folk unfortunate enough to live among them.